Midwest Rehab is a privately owned corporation with over 20 years experience of providing physical, occupational and speech therapy services to a 20 county region in Northwest Ohio and Northeast Indiana. Midwest Rehab provides contract therapy services to home health agencies, hospitals, nursing homes and schools. Midwest Rehab operates 3 outpatient centers with locations in Ada, Delphos, Lima. 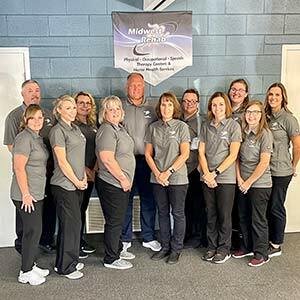 With a staff of over 5 therapists, Midwest Rehab works to achieve the highest quality of care to restore patients to their most optimal functioning level. Midwest Rehab is certified as a rehabilitation outpatient facility and registered at the Centers of Medicare and Medicaid and with most private insurance companies. © 2012 Midwest Rehab. All Rights Reserved.